It's been a few years of bouncing around in the back corners of my mind, but I am finally starting to work on the next issue of Majellen (click here to find out about the first issue: 'Where graphic design meets the city'). Titled 'Laundromatic', this next issue is inspired wholly by laundromats - those ubiquitous urban/suburban spaces, with all their loneliness, ghostliness, grunginess, fadedness and forgottenness. Laundromats have always held a certain fascination for me...maybe it's just the retro typography on those old machines, or the faded vinyl chairs and laminate tables, or the wood panelled walls with hand-written signs...? Maybe it's the vintage pastel colours of old washers + dryers, or the lingering smell of laundry detergent, or just the fluoro-lit memory of years of relentless service contained in a tiny tiled room of unflinching dagginess...? 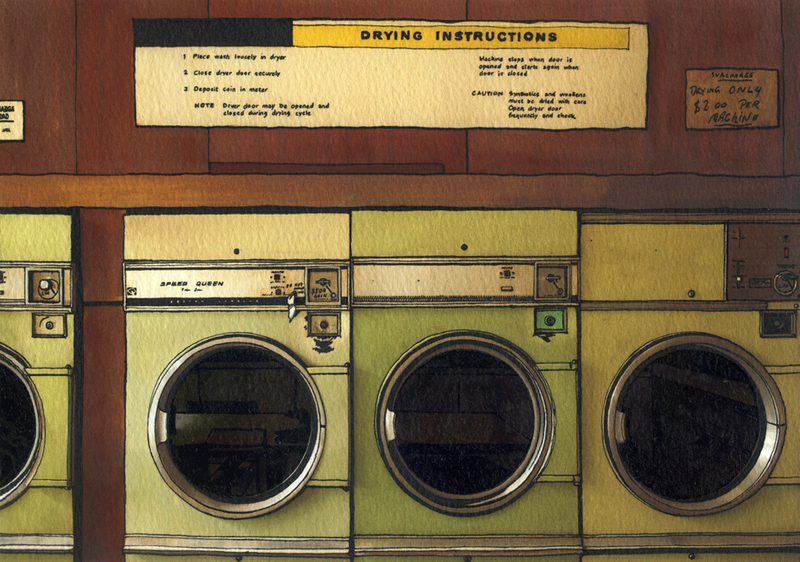 There's just something very evokative about laundromats, and I want to capture that somehow in this next book. ^ These 2 drawings are a mix of ink + watercolour wash - inspired a great deal by Helen's ink sketches, Teo's monochrome paintings, and a book I'm engrossed in at the moment called 'The Picture Book', simply enough. And so this is the name of an exhibition I recently discovered quite by accident...I was walking to work the other day, got caught in the rain, stopped under a sidewalk awning for protection, and what do you know, I'm standing outside a quaint little gallery in Surry Hills...what are the odds? (some would say quite good in Surry Hills). ^ Teo's works are lovely and intimate in size (God, I bet he hates me saying that about them! ), if not a little disturbing in topic. What I really liked though, was that they use vintage papers and stationery as the canvas or backdrop - it really lends his paintings a very tactile and nostalgic sensibility. The old brown suitcase holding a loose assortment of paintings was a nice touch too. So, if you're in Sydney, and have the chance, drop in to Firstdraft gallery (Chalmers St) to have a look-see. I think the exhibition finishes up on the 23rd June, so you'll have to be quick. If you're lucky, you might even get to experience The Sketchbook! 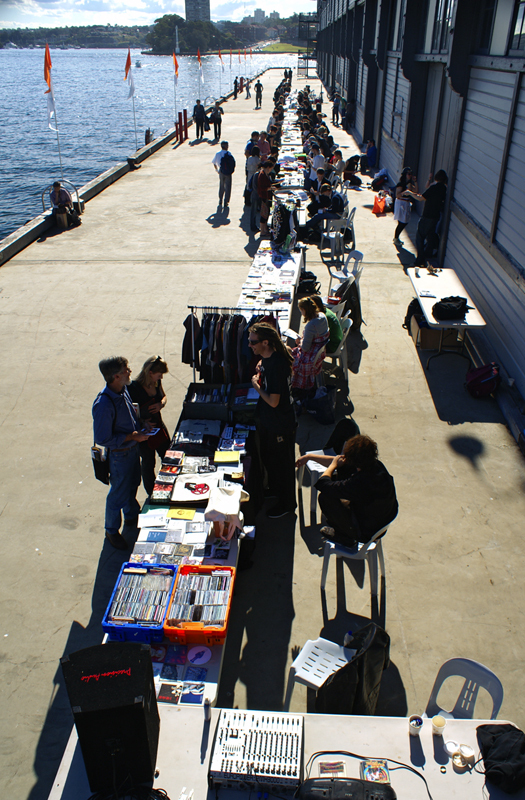 My second zine fair in as many weeks - we decided to try our luck on the Sydney zine scene and see how it compared to Melbourne's "culture capital" claim. ^ By the end of the day, stocks were running low. We sold out of Littles, and Mini Majellen nearly sold out as well (I had about 5 left, selling just over 50). Diagram sold nicely too. Here's Helen looking proud of her first self-published zine which features all her own pen + ink illustration work. Jo, can you see the little fairy we found in St Kilda that morning? If you're in Brisbane and you would like to buy yourself a copy of either Mini Majellen or Majellen, they are both available for sale at S-Lab which is located in the TC Beirne Centre off of Brunswick St Mall in the Valley. If you're in Melbourne and you'd like one, they are available for sale in Sticky, a store dedicated to selling zines (and badge making) located in the Degraves St subway to Flinders St train station. 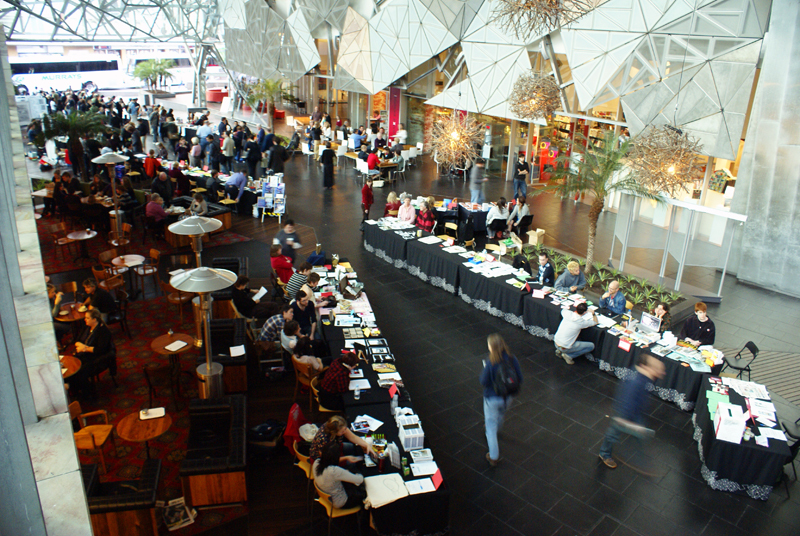 Last weekend, Jo and I went down to Melbourne to try our luck selling our wares at a Zine Fair (as part of the Emerging Writer's Festival). 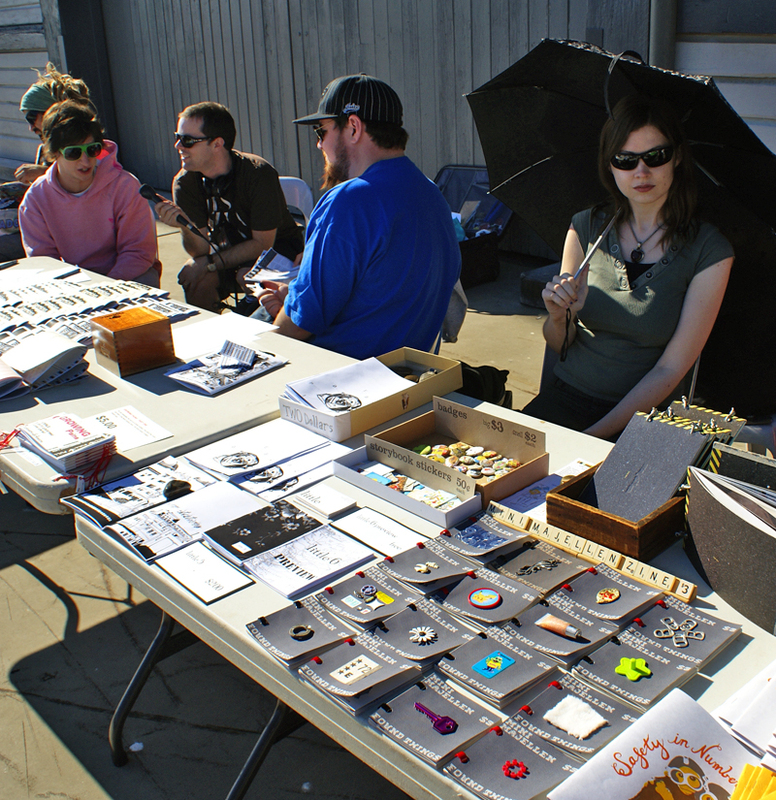 It was a busy day and the sales ran hot, and despite having to squish everything up on our measly half-table, we sold a great deal of zines. Best of all, we met a lot of interesting people and had a chance to have a sticky-beak at all the other types of zines + goodies being produced out there. 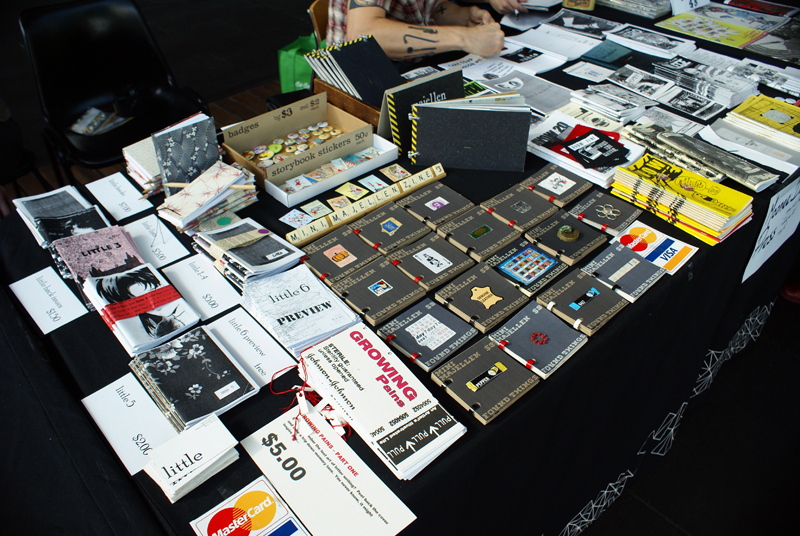 ^ This was our half-table, crammed full of goodies. 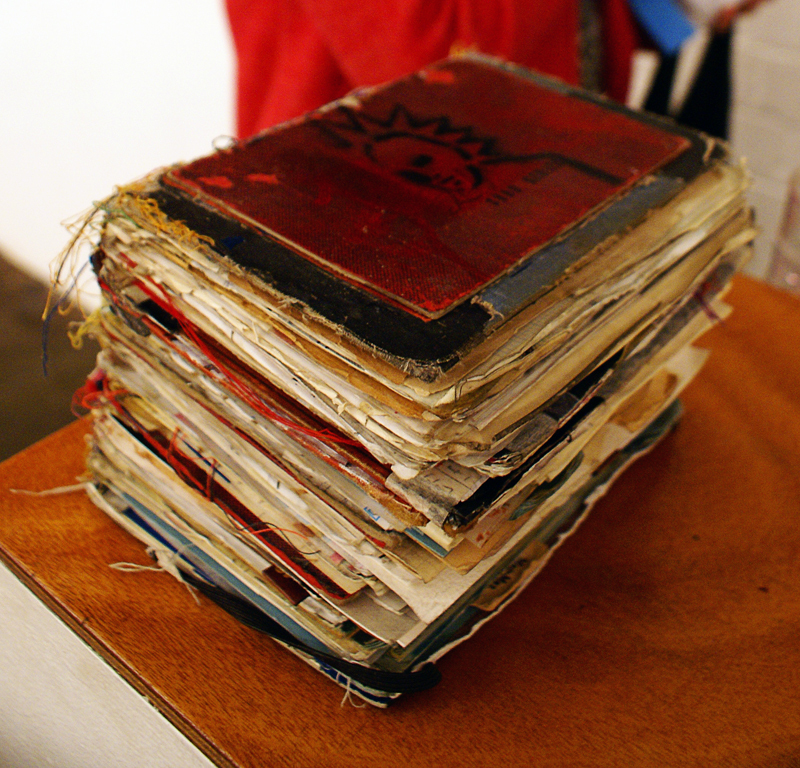 On the left were all of Jo's 'Little' zines, handcrafted books, and Jay Dee's 'Growing Pains' zines. 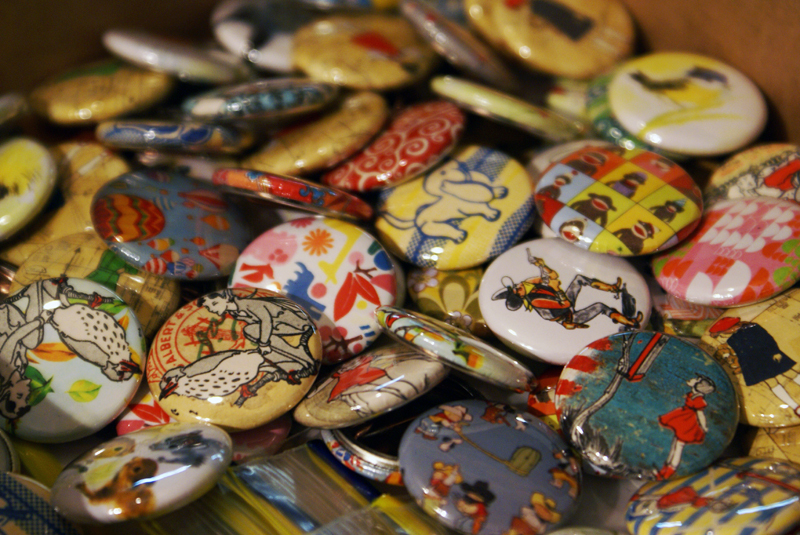 On the right were my Mini Majellens (with the 'found things' on the covers) and Majellens, as well as a box of badges and a box of stickers. ^ It got quite a bit busy at times throughout the day! ^ We visited the Sticky shop in Degraves Subway to utilise their fantastic badge-making facilities. Lots and lots of cutting out circles!! Thanks Jo for all your help - you must be a circle-cutting pro by now! 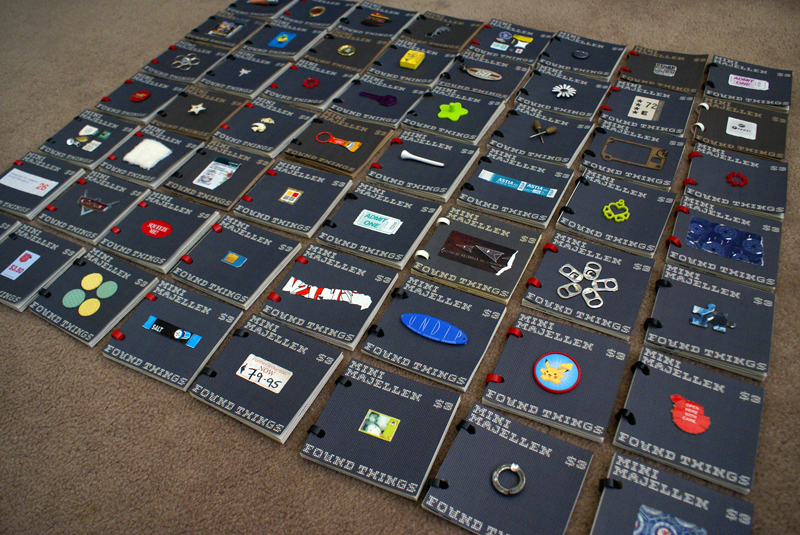 ^ We made A LOT of badges!...luckily they're quite straightforward to make, especially when you get into the swing of it. 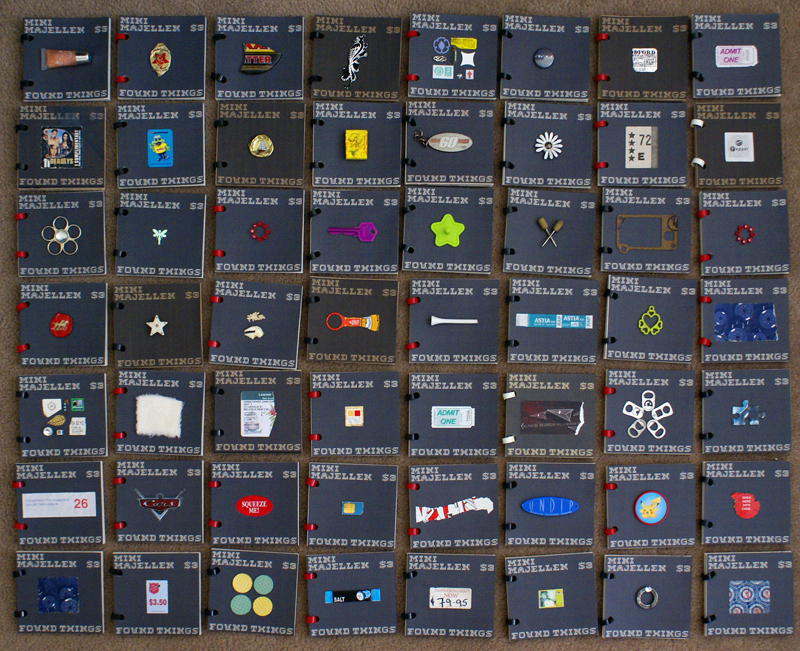 I'd even consider buying a badgemaking machine if they weren't $800 a pop. So yes, lots of fun was had in Melbourne.